Recipe from Sudqi Naddaf, executive chef at Kempinski Hotel Mall of the Emirates. Mix all ingredients for the batter and stir until well-combined. Set aside for 20 mins. Heat a nonstick pan on medium low heat, pour ¼ cup of batter and cook until the batter is no longer wet (about 30 seconds) and the bottom is golden brown colour (do not turn over). Set aside to cool. To make the filling, pour milk, whipping cream, sugar, and water mixed with cornstarch in a medium-sized pot on low heat and stir. Cut the white toasted bread into pieces, add to the pot and stir. Mix until the custard begins to thicken. Add rose, the pomegranate seeds and orange water and stir until it becomes very thick. Remove from heat and pour into a bowl. Cool down and refrigerate. For the orange suzette, caramelise the sugar until it becomes golden brown, add the butter, and then the orange juice, zest and vanilla pod together. Cool down to room temperature, then add the orange segments. 5 In a bowl, mix together the vanilla ice cream, pistachios and pomegranate seeds. Spoon the pomegranate filling onto one side of a katayef slice and fold over to make half moon shapes, seal the katayef pocket by pressing down the sides gently with a fork. Repeat with the remaining katayefs. 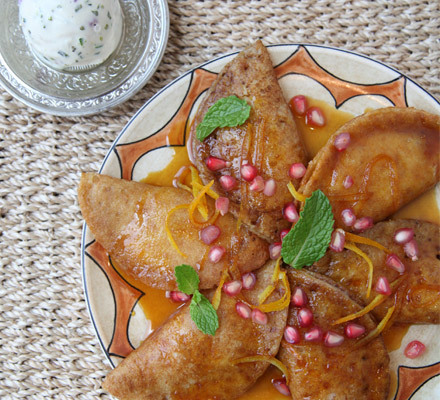 Pour the orange suzettes over it, and serve with scoops of the pistachio-flavoured ice cream.